Fry cashews and raisins in 1tbsp oil and set aside until ready to use. For the Sugar Syrup: In the meantime combine sugar with ½cup of water in a heavy bottom pan. Bring the mixture to a boil and let it simmer until it reaches one string consistency. Keep it warm. For the Boondi: Add water to besan and make a batter that has buttermilk/ pancake consistency. You should be able to pour through the round holed ladle. Heat oil for deep frying on medium heat. Pour the chickpea batter on the round hole ladle and spread it around so even shaped round boondi falls into the hot oil. Fry only boondi only till it changes to light golden color. Frying any more would make the boondi too crispy and it will not absorb sugar syrup properly. Remove the boondi with a perforated spoon and put it directly into the sugar syrup. 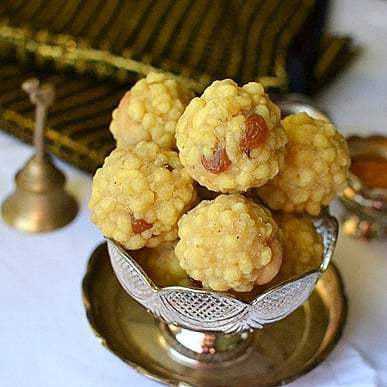 Once all the boondi making is done and added to the syrup, mix in ground cardamom, roasted cashews and raisins and mix well and once it is cool enough to handle, form into lemon size balls. Let cool and store in an airtight container. These will last for at least 10 days if well stored (and if not gobbled up before that).